There was a lot of cool stuff going on, especially the idea of starting out in the present with Ollie handling Diaz’ crooked cops and then backtracking ten hours to show you what led up to that moment. There were some themes tonight that seemed a bit like art was drawing from life in terms of the real-word political parallels of some of Ollie’s actions. But that wasn’t the main focus in this episode, nor should it have been. The meat and potatoes of tonight can be summed up by and attributed to one word. Last week, I wrote about how I didn’t understand what Diaz had given Laurel. I assumed it was the Vertigo drug, but wasn’t sure. In fact, I think I ended my column asking if folks thought the same thing or if we weren’t supposed to know exactly what it was at this point. So, at the end of tonight’s episode, it was like my head exploded when I realized Diaz had the lawyer use the Vertigo to set Ollie’s psychedelic trip in motion and subsequently make one fantastic episode in process. I love redemption stories. More specifically, I really like when a hero is forced to confront himself/herself. In sort of A Christmas Carol fashion, we saw Ollie have to do this tonight—essentially being visited by “ghosts” of his past and the ramifications of his decisions as the Green Arrow. I thought it was a pretty genius to use the drug as the catalyst to take Ollie on this “journey” of self-enlightenment (of sorts). Genius in a storytelling sense because it allows him to “travel” in and out of places and times that would otherwise not make sense. I mentioned last week that Ollie and Green Arrow are one and the same and that’s a problem. John reinforces this notion tonight, too. In fact, I think everyone knows this except Ollie. Before you know that Ollie is on Vertigo, you see a man who is clearly stretched too thin, battling anxieties and feeling overwhelmed and abandoned. We see him (understandably) snapping and unable to keep his emotions in check. When you learn that it could have been the Vertigo affecting his mood, you kind of give him a pass. However, I found myself thinking more along the line of John’s point of view and that maybe we were seeing the “real” Ollie. The line between hero and vigilante is becoming very blurred and it’s harder to separate Ollie from the Green Arrow gimmick. Like the Adrian hallucination kept driving at, he’s his own worst enemy. Whenever heroes find themselves in this dilemma, where they’ve really lost their way, it usually takes two things to get them out of it: friends/family and confidence in oneself, both of which we saw tonight. Yes, Ollie has burned bridges with a number of people and we even thought that Felicity might be on her way out, but she stuck with him and helped him when he needed it most. But as important of a role as Felicity played, I’m not sure that happens if not for the real hero of tonight’s episode…Quentin. Truth be told, I had lost my faith in Quentin as a character. I thought he had become a one-trick pony under the guise of him being a grieving father. But like I always say, Arrow has a way of making me look at things differently when I least expect it and tonight was another great example of that. 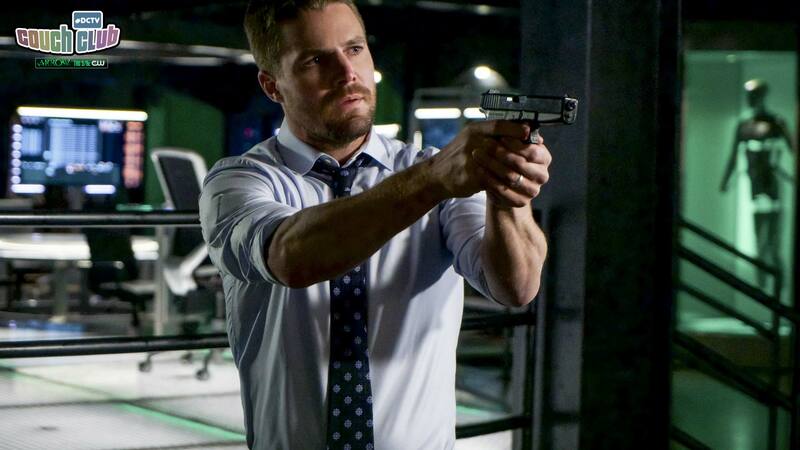 Looking forward to seeing how these last few episodes go now that Ollie is impeached and also to hearing what Diaz has up his sleeve for the Emerald Archer.